Star Trek: Deep Space Nine. Never taken out. scuffs, edge wear, card bents, etc. by Diamond Select Toys. Major Kira Nerys. -Security Chief ODO. MAJOR KIRA NERYS, MORN & GUL DAKAT. (DEEP SPACE NINE). LIGHT PLAY WEAR, PAINT WEAR. Leeta The Dabo Girl. Kang (From 'Blood Oath'). 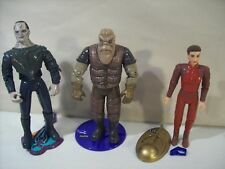 PLAYMATES STAR TREK DEEP SPACE 9 SPECIAL EDITION SET 2. Intendant Kira (From 'The Mirror Universe' Episodes). A MUST OWN FOR ANY STAR TREK DEEP SPACE 9 COLLECTOR! Major Kira Nerys. S hipping. I am just a guy with a love for collectibles and toys. I am easy to get along with. If I make a mistake rest assured I will fix it and make it right. Rest assured I will have your order out the door promptly. Playmates Star Trek MAJOR KIRA NERYS . Bajor Edition Collector Series 9" Doll. 1997 Playmates Star Trek Collector SeriesBajor Edition MAJOR KIRA NERYS. She is complete with all parts and is in excellent condition with tight joints and little to no play wear. These were produced by Playmates Toys from the early to mid 1990's. Star Trek Major Kira Nerys. He is new and has not been opened. Star Trek Kira Nerys. She is complete with all part and is in excellent condition with tight joints and litle to no play wear. These were produced by Playmates Toys from the early to mid 1990's. I will do the rest for you. You receive everything in the photo. MAJOR KIRA NERYS. DS9 FIRST OFFICER. Excellent Condition - Loose & Complete w/all Accessories. 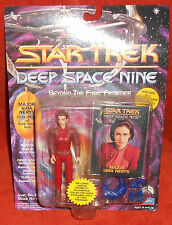 Playmates Star Trek Deep Space Nine Major Kira Nerys 4 1/2" Action Figure NMOSC! Check out the photos. Super great toy for the kids or to add to your collection. 1993 Playmates Star Trek Deep Space Nine Major Kira Nerys, First Officer of Deep Space Nine. Deep Space Nine Gear Bajoran Action Base. Small cardboard crease front left (rear right). Bajoran Tricorder. Don't miss out on this great item. This is Major Kira Nerys released by Playmates Toys in 1993 in the Star Trek: Deep Space Nine line. This is a vintage Star Trek action figure. There is damage to the packaging (see pictures). This item comes from a smoke and pet free home. If you have any questions or for further pictures, please email. Payment within 3 days. We will combine shipping if you win multiple items, so please wait for an invoice before paying. Thanks for looking!! MINT IN BOX. SMOKE FREE, NEVER OPENED. OUTSIDE THE U.S. WILL BE MORE.NOTE. 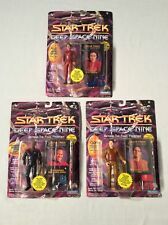 Star Trek Deep Space Nine DS9 Quark Figure Playmates 1993 6203 MIP. Condition is Used. Shipped with USPS First Class Package. (There were only 4 characters produced in this series, this is all of them.). in height. They are all in original condition, never removed from cards, but there may be slight bends and creases to the card backs due to poor storage. 1994 Applause. MAJOR KIRA. Star Trek Deep Space Nine. Star Trek: DS9 MAJOR KIRA NERYS. Star Trek MAJOR KIRA NERYS. from ST: DS9. This is Major Kira from Star Trek: Deep Space Nine. Kira here is made by Playmates, and dated 1994. STAR TREK MAJOR KIRA NERYS FIGURE! NM! STAR TREK 50TH ANNIVERSARY! STAR TREK 50TH ANNIVERSARY! MAJOR KIRA NERYS AS SEEN IN HER DUTY UNIFORM! FROM STAR TREK DEEP SPACE NINE! 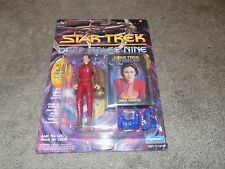 Star Trek Deep Space Nine Major Kira Nerys Action Figure 4"
Significant stains or flaws will be noted above, if applicable. In the original packaging from 1993. Clean, only displayed, unopened. Selling as is and as seen in pics. Thank you. This card is in near mint condition. The Card lays flat, finish is glossy. STAR TREK, DEEP SPACE NINE, MAJOR KIRA NERYS, WITH UNIQUE SKYBOX PLAYMATES COLLECTOR CARD, PLAYMATES, 1993, MINT ON CARD. Card is in good condition, with minor wear & tear, and has never been opened. Free shipping is for USA only! INTERNATIONAL BUYERS: Please use ebay's Global Shipping Program. PayPal only. DEEP SPACE NINE- THE FINAL FRONTIER. BAJORAN ACTION BASE.